AVAILABLE FIRST WEEK OF MAY!!! 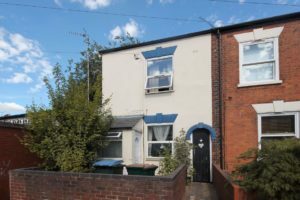 A well presented three bedroom end terraced house located in a sought after residential area. Comprising a lounge, a large kitchen/diner, two double bedrooms, a single bedroom and a shower room. Further benefits include a large garden, gas central heating and a garage with parking for one car. No bills included. Council tax Band A.